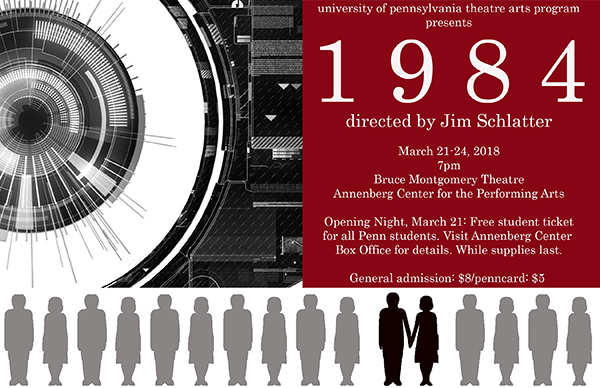 Theatre Arts spring mainstage production of 1984 will be directed by Dr James F. Schlatter, running March 22-24, 2018. A small company of actors engages George Orwell’s terrifying and terrifyingly contemporary vision of a world of mindless conformity, inescapable surveillance, and absolute allegiance to state power. Only one man, who lives almost entirely inside his own skull, and one young woman, who fiercely if clandestinely also claims her “ownlife”, stand together against totalitarian obliteration. Do they stand a chance? Do two plus two make four? Come and find out. New dates: Thursday, March 22 through Saturday, March 24. March 22 @ 7pm. March 23@7pm. March 24 @ 2pm and 7pm. Free tickets to Penn students with ID for the matinee performance on March 24. Tickets available while supplies last and must be picked up at the Annenberg Center box office during regular business hours. Please note: All tickets for Wednesday's performance can be exchanged for any other performance at the Annenberg Center Box Office, pending availability.